NOTE: I also have thousands of my old NYC pictures archived on my flikr account. Be sure to check them out as well All of the pictures on this site have been taken by me personally,unless otherwise noted. If anyone has any neat NYC highway photos, especially older ones, I will be happy to include them and I will gladly give the sender proper credit for each photo. This page is constantly updated, so visit often!. To view any particular highway, just click the link for that particular highway, and the same goes for the various accidents,just chose what you want to view. Any thoughts or questions can be emailed to: crazeenydriver at aol dot com. I have disabled the link cause I am sick of the spam bots. 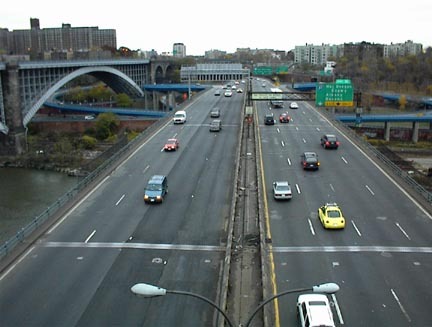 The_Great_Noreaster Of 2007 in Oradell N.J.
Below, you can see a panoramic view of the corkscrew ramps that connect the Cross Bronx Expressway, Major Deegan and approaches to the GWB. You are facing South towards Yankee Stadium. These ramps are known as the corkscrews because of their unique twisting design not unlike that of a corkscrew. 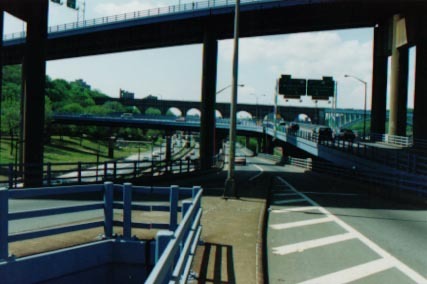 These ramps link the Cross Bronx Expressway with the Major Deegen. In this picture you are looking south toward Yankee Stadium.